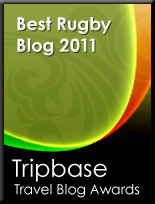 TOTAL FLANKER...a rugby blog: Who'd have thunk it? I was very surprised to read in the Telegraph today that Capital Radio Breakfast Show host Johnny Vaughan is a big rugby fan. Perhaps it's my own prejudices forcing their way through to the surface here, but Vaughan's slightly dodgy, barrow-boy, likely-lad image does not, at first glance, lend itself to the oval ball game, probably not helped by the fact that 20 years ago he was jailed for 4 years for attempting to sell cocaine to an undercover policeman (not the brightest thing to do). The image, however, appears to be just that - an image. All rugby league, soccer and Welsh rugby fans will be delighted to know that Johnny's background does indeed conform with their stereotypical perception of an English rugby union follower - yes, Johnny was indeed once a chinless, toffee-nosed, public schoolboy, attending Uppingham School in Rutland (whose other famous old boys include the likes of actor Boris Karloff, Carphone Warehouse magnate Charles Dunstone and fellow petty criminal Stephen Fry - amongst many others). So, having played rugby at his prep school and at Uppingham (and, it transpires, having played scrum half for the Lincoln Prison team) it is perhaps less surprising that rugby is Vaughan's preference. "I like the way the crowds are connected with the game more than in football," reveals Vaughan to the Telegraph. "You feel every rugby spectator plays or coaches for a fifth XV at his club. "In rugby that connection with the game remains. These days we think business improves sport, but sport used to be above business. We lost the way with football, but you still feel that there's more purity in rugby. "It's the greatest team game - not the most beautiful, nor the most skillful, but there's a place for everyone and everyone has their place...Rugby is so complex because of the broad range of skills and physical types that have to come together to make a great team." Couldn't have put it better myself Johnny (try telling that to the powers that be at the IRB).